Working with Beyonce was something that I could have never fathomed happening to me. It was, hands down, the most extraordinary experience of my life. Period! Kim Kimble, from our show LA Hair, brought me in to work with Beyonce – it kind of worked itself out that she needed more people on Beyonce’s team to create the ridiculously amazing look for the now infamous Super Bowl 50, and then she brought me back on a year later for her VMA performance of Lemonade – also JUST as sickening. 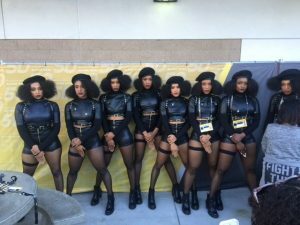 For the Super Bowl, we were in charge of creating a Black Panther/Black Power vibe. Let me tell you, being surrounded by the energy of such a strong, African American experience was so incredibly powerful. Everyone knew we were working on something important and you could feel it in the room. 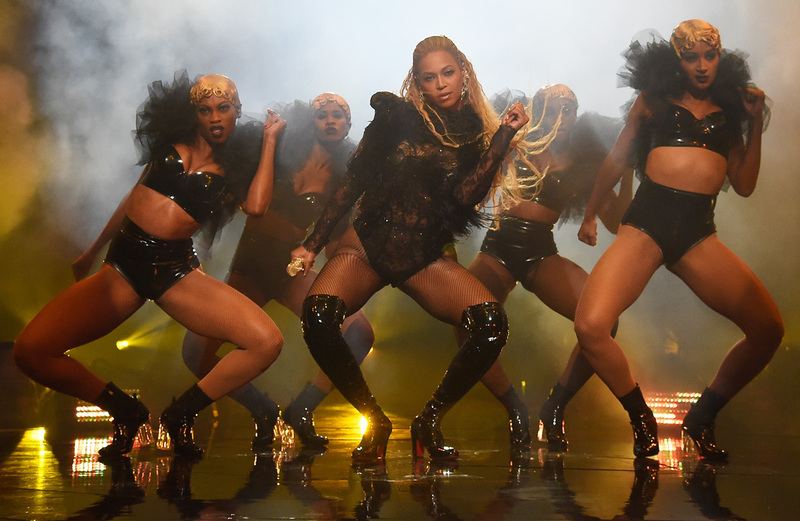 Now, Beyonce is the ultimate professional, but she’s a star. She has this presence that simply commands a room. When I first met her, I was combing out wigs with my back turned to the door, and when she walked in, her presence was so electrifying that without knowing why, my body told me to turn around. First impressions? WOW. She’s such a natural beauty. I noticed the small detail of her ankle chain and how she smelt like … money haha. At the Super Bowl, I was the only caucasian hairstylist working on Beyonce’s team, so obviously I stood out. I was just so proud of myself for getting to this point and being able to slay. I was exactly where I needed to be! That year, Bruno Mars, Coldplay, and Lady Gaga were also performing, so security was so beyond tight, not only would we get x-rayed every single day, but so did our cars! I had never seen an x-ray machine that could cover the whole length of an Escalade. I wish I could have taken a picture, but obviously, that was not allowed. We got there on a Wednesday and did dress rehearsals up until Super Bowl Sunday. In true Beyonce fashion, dress rehearsals meant full hair and makeup every single day until she got her performance perfect. Hair changes, outfit changes, the whole nine yards. It was completely surreal. The buzz and the energy in that stadium, being on that green, is something I can’t explain. It was electrifyingly vibrant and my body felt a way I had never experienced before, nor have I experienced it again. I felt so good about myself knowing that I had just accomplished working with one of the biggest stars in the world, in one of the biggest productions in American history. Then there was the VMA’s a year later. In true Beyonce fashion, she once again SLAYED. She flew us to New York, and when we got to the sound stage that first day, she was just in her “street wear” (an amazing fur coat of course) practicing on a taped off area of the cement floor. Real. Raw. The other artists and I were in awe. I played it off like it was no big deal, but the truth is, I was just as enthralled and emotionally uplifted as the first time I met her. It was still crazy to be just steps away from her and her family – Blue Ivy included. I can’t say enough amazing things about this woman, her tenacity and her eye for perfection. Being able to work on her team was seriously a dream come true. And the day of the performance came! She killed it, and if she was as stressed as the rest of us, it never showed. We were doing traditional African looks for the performance, and there was just so much to prepare between the extension hair and getting 50 backup dancers ready. She wasn’t feeling well, so she was whispering to try and protect her voice, but she was still so calm and assertive; it was incredibly inspiring. Before she went on, we all stood hand in hand in a huge circle, and she prayed for us. She prayed that she would feel better, and she asked for all of us to let go of our fears and know that in that moment we were where we needed to be. Everyone was crying and getting emotional, and when she left the circle to do whatever she was doing, none of the rest of us moved. We couldn’t stop staring at her. She looked back at this immovable crew, and I’ll never forget the look she gave us. It basically said “What? Why are you all looking at me? I don’t give a crap if I’m Beyonce – whatever.” And she strutted away. Just the realest person you will ever meet. Anyways, I’m rambling, so check out these pics of the day, they’re pretty freaking amazing. *Disclaimer: Not all the looks in every photo were done by me.